If you're anything like me, you're hard-wired to strive for perfection. As a chubby kid, I learned early on that if I performed well, that was a quick way to get the acceptance and praise that I was so desperately seeking. I learned to get good grades, to perform for authority figures in a way that got me positive attention and to otherwise morph myself to meet the standards being set by others as a way to fit in. But my body was always a barrier to this. I went on my first diet at the age of 7, but no matter how much I tried to deprive myself I was always the biggest girl in my class. At the age of 14, I went out for the crew team and found that, finally, my size was an asset: I was almost instantly one of the fastest girls in the pack. I realized that although I might not ever be the perfect, petite, demure girl that ruled the social scene in high school, I could be a big, strong, powerful female athlete. My perfectionist tendencies spiked to an all-time high! I poured my energy into my training, seeking out strength training and nutrition coaches who taught me to tailor my habits for maximum performance. I got recruited by a number of top institutions, and ended up accepting my appointment to the U.S. Naval Academy. Being a female athlete became my primary identity at Navy, the hub upon which all the other spokes of my life (social, romantic, professional, academic, etc.) were fixed. 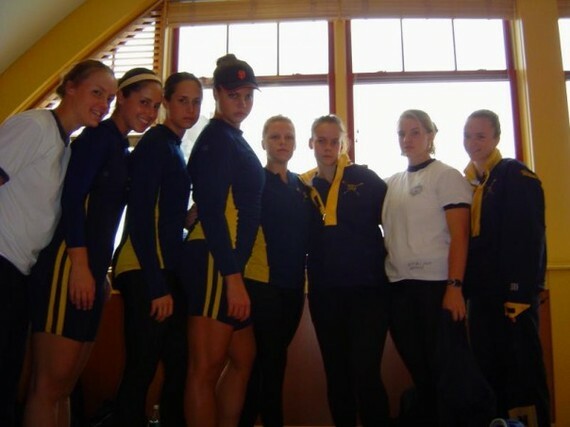 Me (in the San Francisco Giants visor) at the Head of the Charles regatta with my Navy Crew teammates. If ever there was another area of my life that wasn't up to standard, I could always find solace in athletics. If I had a bad day, I would lace up my sneakers and go for a run (on top of whatever practice(s) I'd already had for rowing that day). If I wasn't at the top of my class academically, or in military training, I could best many of my peers (male and female) in the weight room. It wasn't until I injured my back the summer before my Senior year at the Academy that I realized that I wasn't just training my body and making it stronger, I was actually hurting it. But by then, the damage had been done, and my relationship with my body (in addition to the rest of my life!) would never be the same. I know many women out there have their own experience of perfectionism with their body. We toil in the gym. We put our bodies through crazy experiments with our diets. We apply and consume serums, wraps, powders, pills, juices and other "snake oils" that promise to transform our bodies virtually overnight. When those don't work, we blame ourselves and internalize the shame of those failures. "I'm not disciplined enough," "I'm too lazy," "It's too hard for me," and "I don't finish things," are among the self-defeating things we tell ourselves when we fall off yet another quick-fix diet wagon. Me as a plus size model, feeling healthy and strong as a size 14/16, 210lb woman at 5'10.5". Photo by Elina Khachaturyan, hair by Christine Poindexter, outfit by Nike. I'm not a licensed trainer or nutritionist, but I do know this: the only approach that has actually allowed me to achieve a greater level of love, acceptance and freedom with my body has been to abandon any attempts to change it, and instead embrace it exactly as it is. Rather than obsess over transforming my body, I work on transforming how I feel about my body. And instead of making the gym a place that I punish, abuse and mutilate my body, it's a place that I go to show my body love. Perfection is a myth that keeps us shackled to fear, shame and self-loathing. You have it in your power to tear off those shackles and just start loving your body instead!